For the first time in days, one of the islands in the central Bahamas was given a little while to breathe this afternoon. Unfortunately this was because the eye of hurricane Joaquin moved directly over San Salvador and it began to retreat from the archipelago. This is a microwave image from that time. Now at 8 pm Eastern that island is being lashed by the back end eyewall. 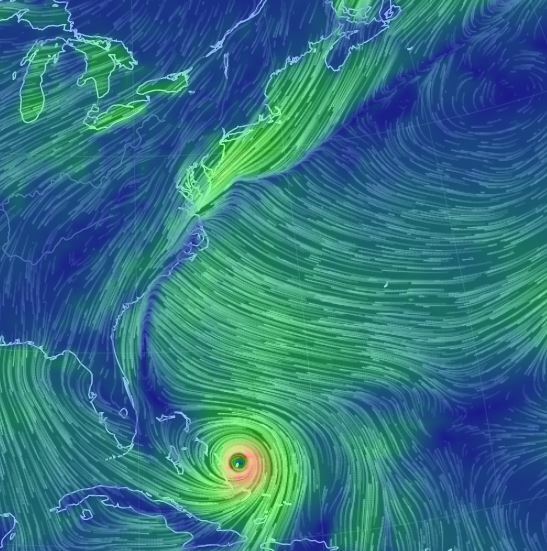 The good news is that Joaquin is finally accelerating out of the Bahamas toward the northeast. The route out of the Bahamas will be fairly parallel to the track in to the Bahamas. 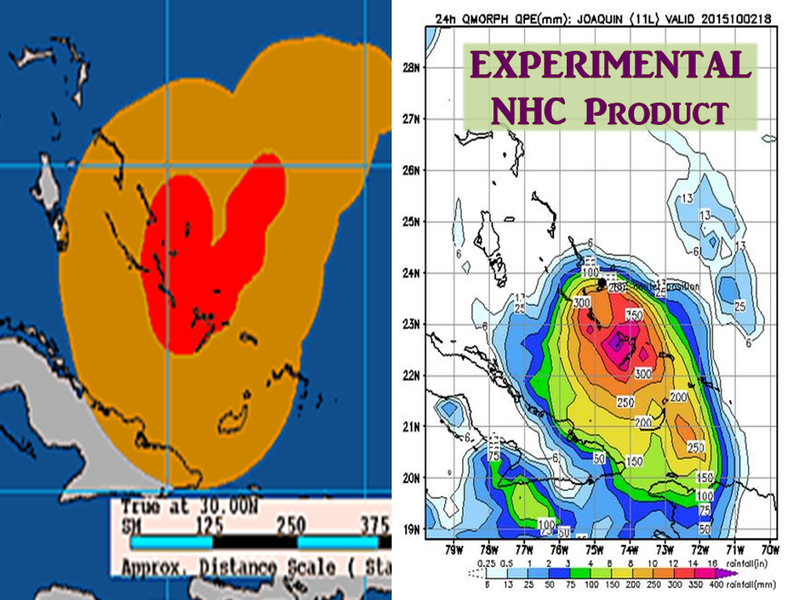 We have a day or two to watch to see how close Joaquin will come to Bermuda, and to hear from the folks in the Bahamas. The Hurricane Hunters have been in this system much of the day and have seen this system weaken briefly to winds of 125 mph. They have tracked the very sharp clockwise turn overnight and today as well. We also got to see what may have been some upwelling between Crooked Island and Rum Cay that halted the eyewall replacement cycle. Recent hurricane hunter observations suggest that some strengthening may have taken place this evening, although only at flight level. Extreme conditions continued for Crooked Island, Long Island, Rum Cay, Cat Island and San Salvador today. 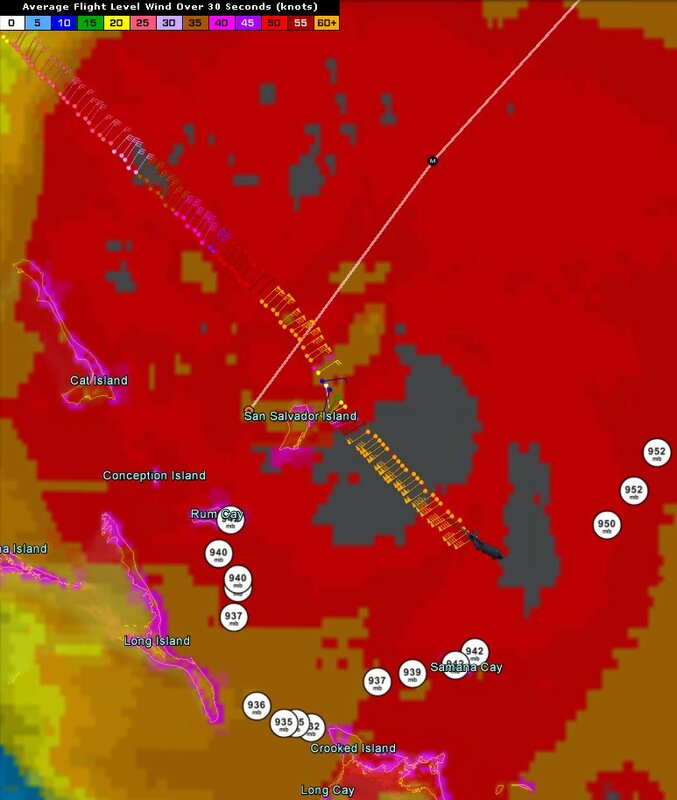 Hurricane force winds upwards of 125 mph continued on those islands with tropical storm force winds expanding to two-thirds of the Bahamian islands. Rainfall just in the last 24 hours ending at 2 pm today was also excessive again. If added to yesterday’s totals, it’s probable that a few of these islands have seen two feet of rainfall this week. This slow-moving system will continue to drop rainfall through tomorrow morning and into the afternoon until Joaquin moves away…finally. Seas already up along the US coast today associated with winds from Joaquin in Florida and the gradient farther north. Waves of 5-8 feet have been seen along the east coast from Florida to Virginia and farther north. This wave field will move north and slow abate in amplitude this weekend for the Bahamas, but possibly amplify in the open waters. This will be discussed below regarding Bermuda. Rip currents and deadly currents remain to be a problem for the entire US east coast. 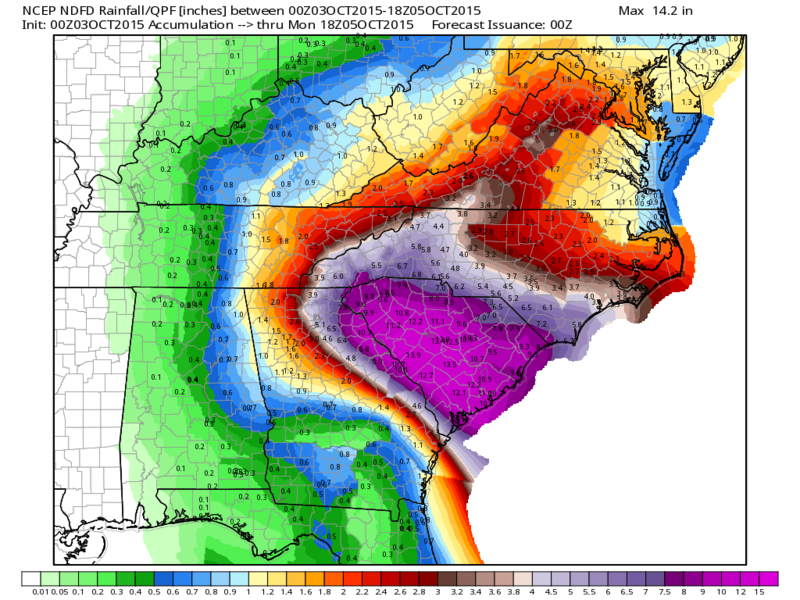 Rainfall along the eastern Carolinas and southern Appalachians reached 2-4″ today ahead of Joaquin’s moisture stream. This rainfall has absolutely no connection to Joaquin, and much of the rainfall over the next 5 days won’t have direct connections to Joaquin either. Variants of flood watches and warnings have been posted for more than a half dozen states ahead of the next wave of rain. Winds also unassociated with Joaquin but as a result of the gradient between it and higher pressures to the north have gotten up to gale force off the coast of the northeast and Mid-Atlantic. A few gusts in excess of 50 mph are possible off of the New Jersey and Delmarva coasts this evening. Depending on the exact angle of the coastline, this wind was forcing some inundation in areas where this flow was onshore. Also note the front from eastern North Carolina down to the northern Bahamas. That frontal boundary is adding a focusing area for additional rainfall. Let’s check in on the moisture still feeding into this system. Things to note on the moisture map below are the hurricane being stuck in the Bahamas for the entire 72 hours, the cool front and trough bringing much drier air into the Gulf of Mexico and the very convergent zone close to the Carolinas coastline. According to the CIMSS maps, not picture here, convergence and thus lift off the coast of South Carolina rival that of convergence within Hurricane Joaquin. This combined with an upper level low seen in purple on the map below entering the Gulf of Mexico will really enhance the chance for excessive rainfall. The Upper Level low parked over the southeastern US will amplify over the next day or two. This amplification co-exist with building surface and upper level winds out of the southeast and east. This will shove the aforementioned front and moisture zone counterclockwise into the Carolinas tomorrow. The Weather Prediction Center continues to forecast a moderate to high chance of excessive rainfall for the Carolinas and Mid-Atlantic. Upwards of a foot and a half of rainfall could result over South Carolina where that moisture axis and jet max match up on the eastern side of the upper level low. Below are the NWS forecast rainfall totals through Monday afternoon. The graphic is from WeatherBell. Note still that Joaquin remains only one moisture source for this flooding event. The same upper level low/trough is picking up hurricane Joaquin already. There is also a weak upper level low currently to the northeast of Joaquin that will move westward ahead of Joaquin. Joaquin will get an additional speed boost as the these paths cross and Joaquin ends up on the eastern side of this system. Most models continue to show that Joaquin will interact with the large then cut off low on Sunday or Monday in somewhat of an orbit, release and escape without capture (Fujiwhara) motion before being capture by the northern latitude westerlies. You can see that cyclonic turn in orbit at around 48-72 hours below and release at 72 hours. 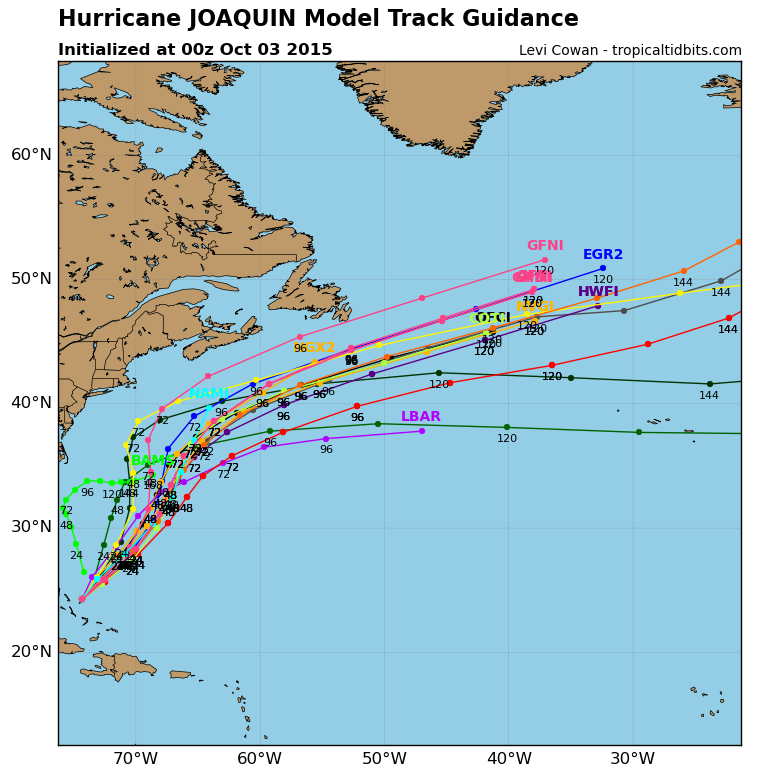 The intensity models are very narrowed in on a solution for the rest of Joaquin’s lifespan. Hurricane hunters have found a closed 30 mile wide eye tonight, so it could regain some structural integrity over the next few hours. Pressure continues to increase. As of the 9 pm hour, pressure has risen about 15 mb since yesterday and sits at 945 mb. Minor changes in intensity are possible as it begins to feed on untapped warmer and deeper waters northeast of the Bahamas, but by late tomorrow we should see Joaquin begin to weaken slowly. 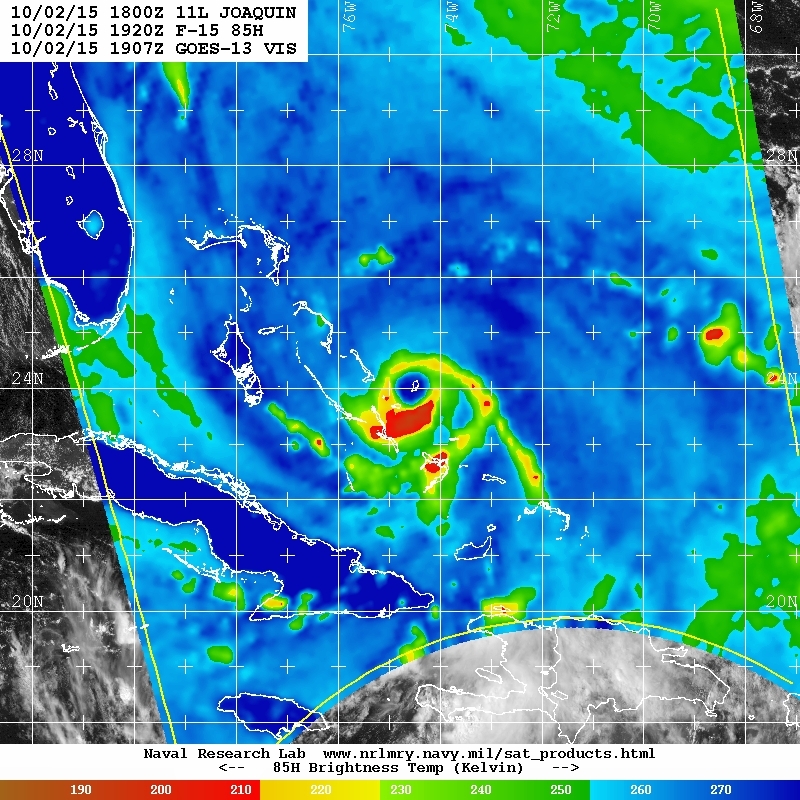 By sometime late Monday or Tuesday, Joaquin is anticipated to drop below hurricane status. With subsequent eastern shifts in track over the last couple of days, the door is open that Bermuda will see impacts as Joaquin passes by. 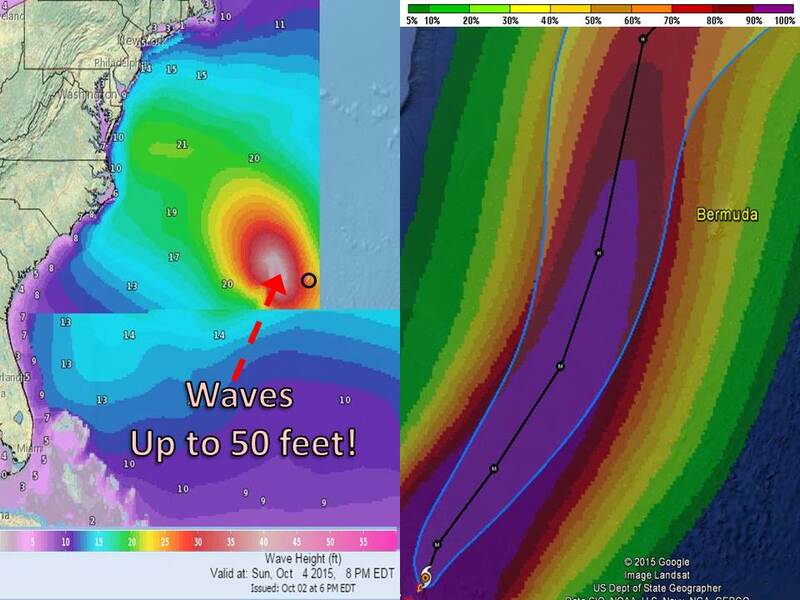 Due to the gradient to the north, waves could actually increase as Joaquin moves northward. According to the Ocean Prediction Center, waves could increase to 45-50 feet just west of Bermuda as Joaquin passes by on Sunday evening. Chances of tropical storm force winds for Bermuda are at better than 30%, and thus a tropical storm watch is in effect there. 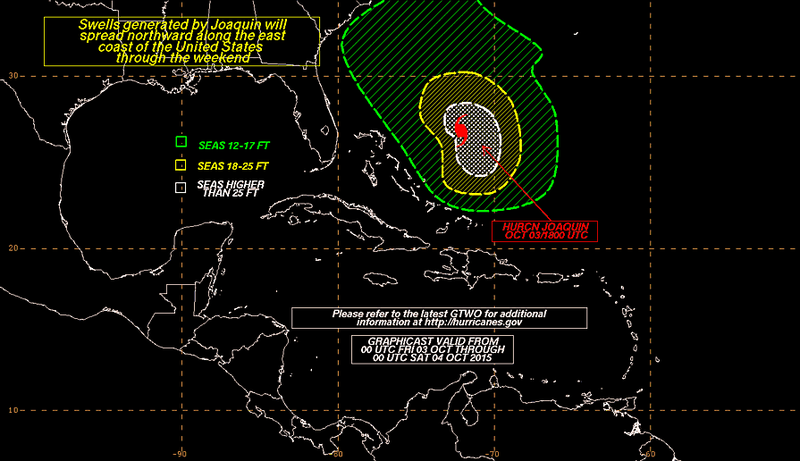 The worst of Hurricane Joaquin appears to be ending for the Bahamas. Hurricane conditions will be ending overnight, and tropical storm conditions will be ending late tomorrow. Storm surges and waves will slowly relinquish their grip as well. Rainfall may take some time to leave as this system has a very large envelope. Thankfully a somewhat squashed appearance is taking shape this evening with the back side becoming drier. Another foot of rainfall is possible for the east central islands with lesser amounts for the rest of the islands, Cuba, and surrounding islands. Take a few minutes of prayer for those of our comrades in the Bahamas. The imagery over the next few days will not be good. Rainfall amounts both in the Bahamas and in the Carolinas will be measured in feet. Stay safe, stay out of the water, and be weather prepared! Posted on Friday, October 2nd, 2015, in Severe Weather, Tropical Weather. Bookmark the permalink. Leave a comment.